The sun is shining. The snow is melting. And that means it’s almost that time of year again — time to get yourself in a raft and get on some rapids! Durango may have more of one thing than breweries, and that’s rafting operators: 4 Corners Whitewater, Flexible Flyers Rafting, Mild to Wild Rafting, Durango Rafting, Durango Rivertrippers, Outlaw Rivers and Jeep Tours — the list is loooooooong, and the whitewater rafting options are endless. We would try to list all of Durango’s rafting companies for you, but there are roughly 2.8 million of them, and we would hate to miss one. 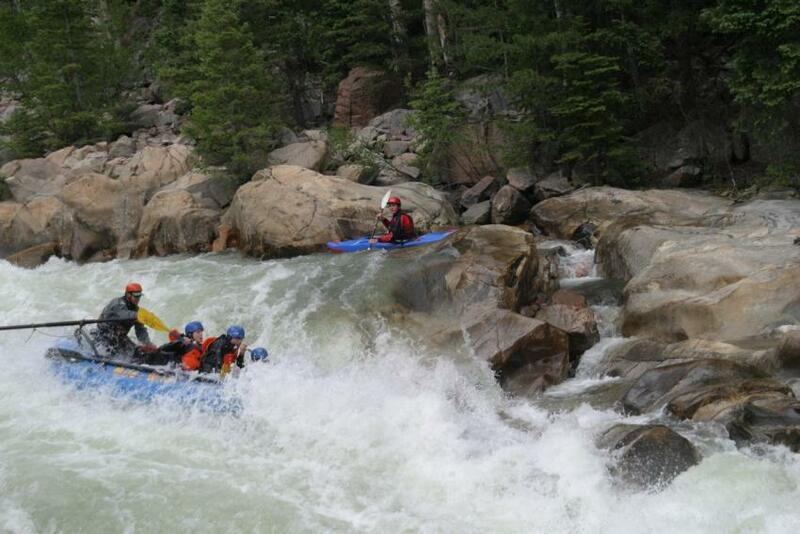 Durango was built on the banks of the Animas River, which is one of Colorado’s major rafting rivers. The Animas makes up nearly 10 percent of Colorado’s commercial rafting market, which makes sense because the river offers some amazing whitewater rafting for people of all ages and abilities. Rafting trips on the Lower Animas are more laid back than the Upper Animas, which makes the lower section of the river perfect for family friendly floats. Depending on the time of year and the river’s flow, the Lower Animas is generally rated Class 2 to Class 3 rapids, so rafters will enjoy calm floats in between boisterous bounces through (relatively easy) whitewater such as the Smelter, Santa Rita and Pinball rapids. The Upper Animas is far more advanced — and far more intense. The 12-mile stretch of river whips itself into a frenzy as it squeezes through the narrow Animas Canyon. The Upper Animas is typically categorized as Class 3 to Class 5 rapids and is one of the most advanced stretches of commercial river in the nation when the water is running high. Veteran rafters can tackle heart-pounding, adrenaline-pumping rapids such as Broken Bridge, Dinner Gorge and Lunch Box. With the spring runoff, Animas River flow usually peaks in May and June, but you can get your rafting fix throughout the summer. Now is the best time to start planning your rafting trip because the floats book up — even with the 4.7 billion rafting companies in Durango. Whether you come to Durango specifically for the rafting or just want to try it while you’re here, be sure to book your room at the Durango Quality Inn for easy access to the river and to any of Durango’s rafting companies.